An extension counter of The Oriental Bank of Commerce and Axis Bank is inside the Campus which deals with the banking facility of the students as well as the university. 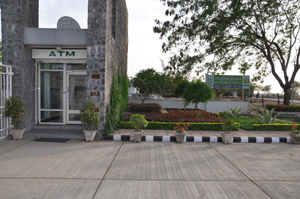 An ATM counter of Oriental Bank of Commerce has been established at the main entrance of the university. An ATM counter of Axis Bank has also been established inside the academic block.